On Dec. 4 I will run in the White Rock Marathon in Dallas. Once a week, I will provide my observations on the connection between the spiritual life and training to run a marathon. Please visit my White Rock fundraising page to honor my daughter and contribute to a great cause. This week is race week. There is no cramming for the marathon. Whatever I have accomplished in my training to this point will have to suffice. In this space, I have talked quite a bit about what I have done in my training and it is obvious that I will be the one who will complete the race (or not). But I started this entire quest in honor of my daughter, Joy, and the great work of Texas Scottish Rite Hospital For Children. I have to restrain myself from making this all about me because Joy is my inspiration. Joy, now three, was born with a Cleft Lip and Palate. Her first surgery on her lip occurred when she was three months old and her palate was worked on when she was eight months old. After her palate surgery, she was in too much pain to eat and stayed that way for an excruciatingly long four to five days. At four months, she was placed in the hospital because of pneumonia and for several weeks afterwards, we had to feed her through a tube to avoid milk entering her lungs. When she was a year old, we had her examined at Scottish Rite for possible curvature of the spine. Sure enough, she had infantile scoliosis and we started treating her and will continue, no doubt, throughout her childhood. 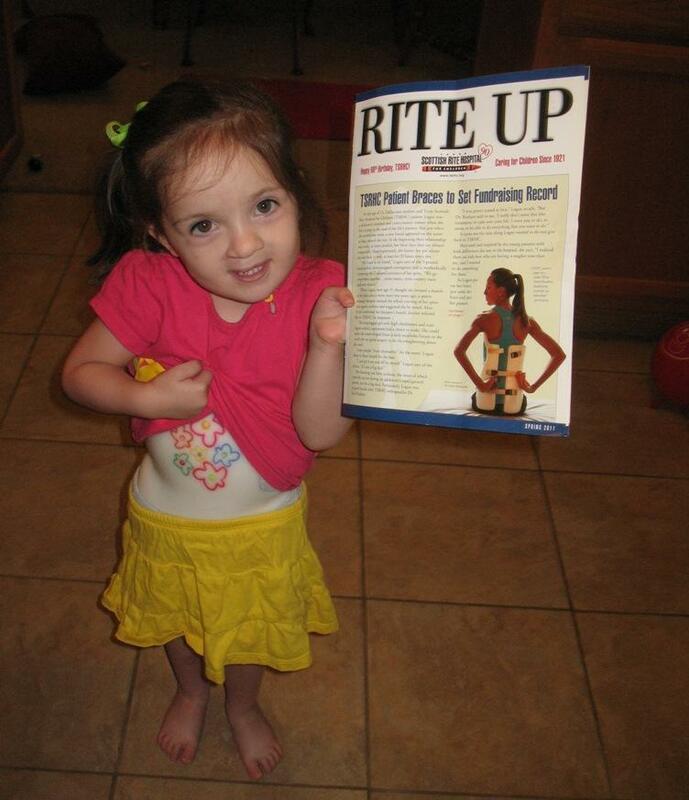 For more than four months, she was placed in a cast that went from her hips to her shoulders. Now, she wears a brace that can come on and off but there is no sign of her getting out of the brace anytime soon. I haven’t even mentioned the eye surgery she had or the hernia surgery or the two additional palate surgeries. I call her a professional patient because she knows her way around a doctor’s office and lets most everything just run its course without too much of a fuss or problem. When she was two, she got a flu shot and didn’t even cry. She is tough, smart, cute, and funny. She lives up to her name and has captured the heart of many who have been around her. I am running for Joy. She is my inspiration. I figure that my five hours of running is the least I can do to honor her, the rest of my family, and other kids that need medical care. So, if I finish the marathon, congratulate me for a job well done but don’t forget the little girl who has already made it through the equivalent of about ten marathons’ worth of medical procedures and surgeries. Joy deserves the attention and pats on the back much more than I do. Update: Joy and I were featured in the Life section of the Dallas Morning News yesterday. They did a story about first time White Rock runners. The story even mentioned the blog. If you have an online subscription, you can read it here. Sometimes I teach a small group session on discipleship and spiritual growth. A question that I often get is “How Do You Know When You Have Heard From God?” This is difficult to answer but I can speak out of my own experiences. Your next steps will confirm what you just heard – When my wife and I felt called to leave our comfortable existence in a small town with quality jobs and low-cost of living to begin working in social ministry in a larger town with no assurance of adequate compensation, we found our confirmation a few weeks later when I was able to secure a job at a local university. My kind of vocation, academic librarian, isn’t that widely available but God seemed to provide exactly what we needed when we needed it. This demonstrated to us that our original word from God to go was for real. The words will sound familiar – This is where your relationship with God bears incredible importance. Many people fail to hear from God because they have no relationship with him. I know my wife well enough to know that when she says certain things in a certain way I need to pay attention and respond appropriately. Through experience with God and a relationship that has grown over the years, I start to recognize that what I am experiencing or hearing (though it seems more like a thought) is coming from God and not from my own prejudices or whims. This kind of relationship takes work, and familiarity with God’s word, but with time and understanding, recognizing God’s voice won’t seem to be such a random phenomenon. This is where step number three comes in. Careful and thoughtful guidance will validate the words – I am an introvert and rarely enjoy speaking just to speak so when I need advice or help with a decision, the advice better be good or at least thoughtful. Christians are so bad at giving advice. We think we have all of this wisdom but what we really have are opinions that we try to spiritualize to look good. Parker Palmer has written extensively on the value of a “clearness committee” that listens, asks non-leading but helpful questions, and brings the person needing guidance to a place where they can more clearly hear the Holy Spirit. I like the freshness and simplicity of Palmer’s approach. Christians need to seriously rethink how they help those needing guidance and direction from the Lord. Pray first, speak tenth. If none of the three items above are happening and confirming what you thought were words from God then maybe you need to ask for more direction from the Lord. You can hear from God but sometimes what we think we hear needs fine tuning and consideration. Training for any serious athletic endeavor is like entering into a laboratory for suffering. Each day is another opportunity to test physical suffering and determine what I am able to manage and overcome, as well as finding my suffering limitations. Some days, suffering is a welcomed ingredient to the training, met with respect and a healthy acknowledgement while other days, suffering seems the most important thing in the world to avoid. But any serious runner will tell you that you cannot avoid suffering and still reach your goals. You don’t complete a marathon on the back of an avoidance of suffering. You have to meet suffering face to face if you want to make progress in your training. My marathon training has taught me about embracing suffering and difficulty. It has become a daily challenge to find the one moment when I tell myself I can do one more squat or one more sprint interval or tackle this hill one more time. And what do I discover through this suffering? Maybe nothing in the moment but the things I regularly do in today’s training, I thought were impossible two weeks ago. Suffering is necessary to move to the next stage in my training. The biggest myth among Christians is that their faith will remove emotional and physical suffering from their life. But this is counter to what Jesus said. He said that in this world you will have trouble (John 16:33) and that whoever wants to follow him must take up their cross (Mark 8:34) and those who want to be first must be last (Matt. 20: 16). Modern western Christians seem to want to try to avoid suffering at all costs but suffering is apparently an important aspect of your spiritual growth. Peter includes perseverance in his great list of add-ons to the faith (2 Peter 1:6). Growth and progress in the Christian life benefits from mountain top experiences and moments of spiritual highs but it excels when it has to work through suffering and endure through an experience where God’s presence isn’t just welcomed but a necessity. As hard as the pain you are experiencing in your life may be, God is using that experience to refine you and mold you into the person he intends for you to be. We have to work through the pain just like a marathoner has to work through the discomfort and strain of training. There are rewards at the end of both of these journeys. You just have to endure. 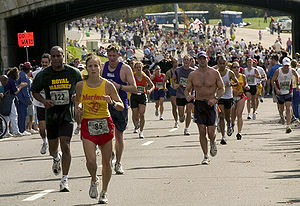 Image via Wikipediaspiritual life and training to run a marathon. Please visit my White Rock fundraising page to honor my daughter and contribute to a great cause. Yesterday, I completed a 14 mile training run. This was the longest run that I have completed. I completed it without a whole lot of trouble, pain, or suffering. It seemed to be a natural progression of my previous training. One quick search on the web for “marathon training” will give you hundreds and hundreds of links to training programs. There may be more training programs than there are marathons to run. Doing this search, it becomes obvious that training is an essential part of completing and excelling in a marathon. No one tries to complete a marathon without training first. The process is training not trying. This should be the same principle in our spiritual life – training not trying. Have you ever tried to be a better person? Have you tried to be more loving or more compassionate, or more giving? Whenever I am left to my trying I realize that my trying has a short shelf life. Gritting my teeth and straining to be a better person never works over the long haul. Just as gritting my teeth and straining to run 14 miles without the proper training would have left me wasted at about mile 4, straining to be more Christlike without the proper training will leave me guilt ridden and down on myself. James Bryan Smith, in his book The Good and Beautiful God, details a spiritual growth pyramid that places the narratives of Jesus at the top point, participating in community at the right point, and soul-training exercises at the left point, with the Holy Spirit in the middle. Smith points out that all of these elements must work together to create a transformed person. Many Christians just focus on right thinking and community and leave off the training aspect. This alone will not create a Christlike person. Others focus on only the Holy Spirit and think that the rest will take care of itself. Spiritual exercises puts your thinking into practice and makes your time in community more meaningful. Training is essential to completing a marathon and essential to growing spiritually. We do not try harder to be like Christ we train intentionally in the context of right thinking and a loving Christian community. Why is solitude a spiritual discipline? 1. Jesus Did It – Read Mark and pay attention to how often Jesus goes off by himself to pray. Being a devout Jew, Jesus no doubt participated in the daily prayers that all Jewish people participated in but scripture tells us that Jesus did more than the prescribed prayer and needed even more time listening to his Father in the quietness and stillness of time spent alone. I have trouble finding the time for solitude much less the motivation. Jesus was intentional about his time with God. 2. It Exposes Your Mind – Try this, go spend 15 minutes in silence and solitude and record the first thought your mind gravitates toward. This is the baseline for your thought life. If you are like me, this thought was probably not very spiritual. Even if your first thought was spiritual, note how fast it took you to move to a less than spiritual thought. In solitude we come face to face with the reality of our thought life. No wonder we like to stay so distracted. Our thought life is a minefield of temptation, negativity, evil, and laziness. We are coming up on the busiest time of the year. Don’t lose sight of your need for solitude. Make this Christmas season filled with meaningful moments, not just with family and friends, but with God. As a librarian by trade, I read frequently and find it easy to locate information on just about anything. So naturally, while training for the marathon, I have been doing a lot of reading and research on training techniques, race day strategies, and personal marathon experiences. But sometimes I have found myself more interested in reading about marathon training and running than actually training and running. I guess I enjoy making workout plans and learning about new techniques more than training itself. The fact of the matter is, the only way to test whether or not these plans and strategies work is to test them out in your training and running. Running is the testing ground for anything I read and research. I have to take what I have learned and put it to the test in my own experience, otherwise it is just words on a page. Have you put Jesus’ teachings and the spiritual life to the test? Have you studied the Sermon on the Mount or I Corinthians 13 and put it into action to see if it works? I dare you to try it. I don’t mean attending another Bible Study or reading another blog but actually putting the words of the New Testament and things like the Ten Commandments and Psalm 23 from the Old Testament into action and test the Christian life. I can read about marathon running and pour over articles and blogs but it is only when I take what I have learned and act upon it that the knowledge that I gained has any power. It may be time for you, as a Christian, to get into training. Quit learning about Christ and God’s work of redemption without testing it out on the track of life. Come and see that the Lord is good.